"Photographer Chicago" isn't just a random phrase that sounded clever to me at the time. Photographer Chicago is the search term that is used most often when people are looking for a photographer in Chicago. How do I know this? Because when I'm not on a photo shoot, I'm studying internet marketing so that I can market my photography business more effectively. I bought a software tool that shows you exactly what people are searching for. 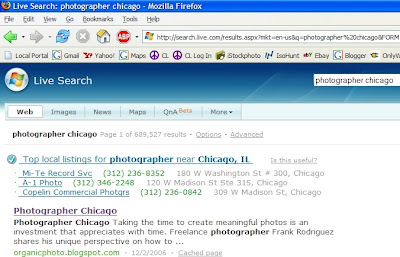 I thought "Chicago pro photographer" or "Chicago wedding photographer" would be more commonly searched phrases, but photographer chicago was way ahead of every other search term. I mentioned in a previous post ("Even Santa Claus is getting hip to blogging") that the search engines love blogs. However, most people still haven't figured this out. Many people have questioned my logic in changing organicphoto.com from a typical artist website that focuses on me me me, into a blog with photography articles that focus on you you you. The results speak for themselves. This website gets WAY more traffic today than it did a year ago. The reason is simple. The search engines are looking for fresh content and you are looking for information (as opposed to self-promotion). Now while it's true that the search engines are looking for images (as demonstrated by Google's Image Search Engine), written content is far easier to "spider" and is generally more effective than images. This idea runs contrary to the saying "a picture is worth a thousand words", but consider the fact that just a few years ago, graphic banner ads were the most common form of online advertising. Banner ads quickly became such a nuisance that we learned to avoid them completely. Are images more effective than text ads? Just look at Google's annual revenues from AdWords ($5 billion the last I heard) and it's obvious that words are more effective than images when it comes to advertising. I never thought that being a photographer would lead me into writing, but I guess it's not so far of a stretch when you consider the fact that the word "photography" comes from two Greek words: "phos", meaning "light" and "grapho", meaning "to write." Photography's root meaning is "to write with light." A "photographer" then would be "one who writes with light." Can you talk a person's ear off about the subject you're most passionate about? Well that's how I am with photography, so it's certainly no hardship to write these blog posts. You can do the same thing. Creating fresh and relevant content is a surefire way to get the word out about your business, hobby, passion, etc. Of course there are many other marketing strategies that complement blogging, but blogging is a free, easy and effective way to get started in internet marketing. "But I thought she was a ____?" Does 0 + 1 = Art?